Just in time for the 2014 World Cup in Brazil (not to mention Major League Baseball’s All-Star Game in Minneapolis) ESPN Radio has struck new digital distribution deals bringing its talk shows and events coverage to iTunes Radio and TuneIn, the companies announced this week. 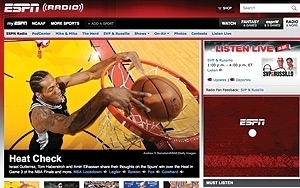 A range of ESPN Radio network programming will be available for round-the-clock live streaming by iTunes listeners, including popular sports talk podcasts like "SportsCenter All Night," "Mike & Mike," "The Herd With Colin Cowherd," "SVP & Russillo," "The Dan LeBatard Show," "Sedano & Stink" and "The Freddie Coleman Show." The distribution deal also covers ESPN Radio’s live coverage events, including the World Cup, scheduled to kick off tomorrow; Major League Baseball’s playoffs and the World Series; college football and basketball; and U.S. Open Golf. Looking ahead, ESPN Radio expects to roll out more content from local stations on iTunes Radio, as part of Apple’s push to provide free streaming of local radio programming. Also this week, iTunes Radio began carrying live streaming content from 42 local NPR stations around the country. TuneIn struck a similar deal giving listeners access to eight of ESPN’s podcast channels, including most of the talkers listed above, as well as ESPN Today in Sports, ESPN Perspectives and live coverage of the World Cup. Back in March, TuneIn announced that it would carry live play-by-play coverage of the 2014 NCAA Division I Men's Basketball Championship courtesy of radio content syndicator WestwoodOne. TuneIn is getting WestwoodOne coverage of additional NCAA championship events, including the Division I Women's Final Four in basketball, the Men's Frozen Four in hockey, the Men's and Women's College World Series in baseball and the Division I Men's Lacrosse Semifinals and Championship. Deals in the digital radio space are coming fast and furious. Earlier this week, WideOrbit, which provides advertising management software for media companies, announced its acquisition of Abacast, a company that specializes in streaming, live and on-demand advertising insertion and other monetization techniques for digital radio.